← Dispatch #19 – Booze. I was always a finicky little scamp as a child; I was fussy, picky and choosey and it is these traits I proudly dragged into my adulthood – it is those very qualities which distinguish me from The Underlings I was warned about during my formative years. And, if there was one thing which blighted my tender years more than any other it was, of all things, Lego. 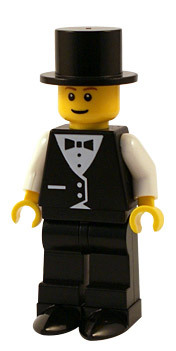 Through my eyes Lego was just a ghastly collection of gaudy-coloured bricks and peculiar-shaped building blocks; they came with minimal assembly instructions and anything constructed fell apart the minute you sat/rode a horse on/over it. And now I hate IKEA – for EXACTLY the same reasons. ONE IN TEN EUROPEANS WERE CONCEIVED IN/ON/UNDER AN IKEA BED. That is a somewhat stunning and petrifying fact, are so many Europeans living below the poverty line that they are forced to shop at a furniture store which basically hacks down a pine tree, saws it into unfathomable chunks and leaves the rest to the consumer? Whatever, it certainly made me prick up my ears and take note of the IKEA phenomenon. Firstly I had to investigate who was behind it; actually I say ‘firstly’ but once you understand Mr I. Kea the key to its stronghold quickly unravels. IKEA, you see, IS, like the British once was, a global Empire. Established in 1943 by Ingvar Kamprad it now has stores in 25 countries and in 2010 had 590 million customers stealing pencils traipsing like herds of cattle, following the arrows through the relentless IKEA maze. Hold the phone! Did I just write ‘established in 1943’? Who starts trading in bargain lampshades and sofa beds in the middle of World War Two and at the height of the Nazi regime? Sweden might have maintained a suspicious hush during those dark hours while the rest of us fought ivory-tooth and manicured-nail, but even for a ‘neutral’ country it seems a bit of a daft time to set up shop. What kind of lunatic wanted to concern himself with living spaces and empire building during…OH MY GIDDY AUNT, NO. Surely not, can you see where I might be going with this yet? Of course, Adolf-bloody-Hitler, a man equally obsessed with living spaces, or lebensraum as he presumably shouted it as his troops trundled into Poland to make room for Germany’s back garden annex. Both Adolf and Ingvar established themselves as empire builders, both were obsessed with living space and both did their darndest to do so as the WWII bombs fell. This is surely more than just a coincidence? My darkest fears were soon realised. Now, this is not news to The Average Swede, but it may well shock my fellow Empirees to the very core. Mr Kamprad is so tainted with a Nazi past I’d be surprised if Hitler’s Nuremberg Rally podium was not the first bit of flat pack furniture sold under the fledgling IKEA name. 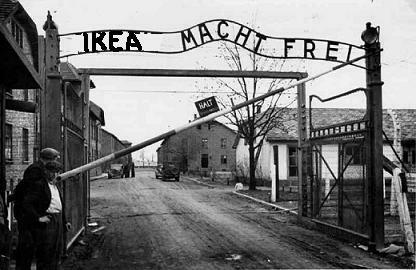 Kamprad WAS part of Sweden’s pro-fascist movement; he joined in 1942, just one year before IKEA was up and running. He both recruited for and pumped money into the right-wing group. In 1943 Sweden’s secret service created a file listing him as a ‘Nazi’. In a 2010 interview he described the leader of the fascist movement Per Engdahl as a ‘great man’ adding “I will maintain that as long as I live”. Per was invited to Kamprad’s wedding as part of his closest circle of friends. I bet the British War ‘Cabinet’ is solid oak and Chippendale crafted! ATTENTION BOTH THE FOREIGN OFFICE AND EMPIREES: It’s a lot easier to subscribe to the Dippylomat’s Dispatches than it is to build an IKEA chair. This entry was posted in Benjamin Disraeli, Ex pats, Gothenburg, history, Hodge Podge, Humour, Politics, RAF, Stockholm, Sweden, Travel and tagged adolf hitler, fascism, furniture, nazism, Per Engdah. Bookmark the permalink. 27 Responses to Dispatch #20 – Furniture. 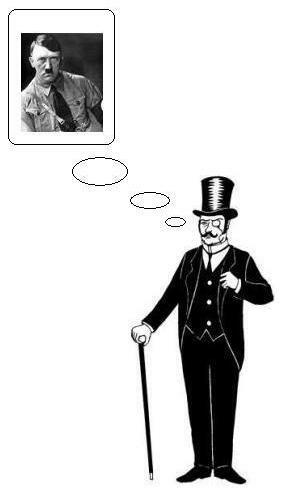 My dear chap, I fear the Ikea Gestapo will be onto you for that rather disturbing montage at the end! I dare say if IKEA ever ‘Google Image’ itself it will be forced to close down the entire internet! 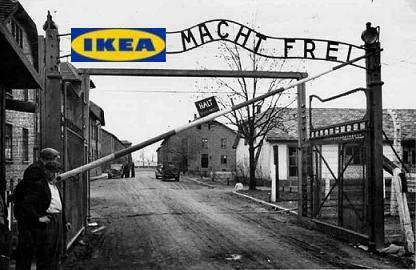 Whilst I am somewhat concerned at the previously unknown (to me) fascist connections of the IKEA brand, I can say that their furniture is actually quite easy to build – long as one displays a modicum of common sense and intelligence. I am therefore shocked that The Dippylomat esq expresses an inability to piece together such simple items. Although, I must confess, not as shocked by this as by the fact that you do not seem to have a manservant available to do it for you! My Dearest Ms B, dare I say that your time in Denmark gave you an unfair advantage when it comes to assembling Scandinavian furniture? My manservants are too busy carrying quality pieces of furniture back from Harrods to waste time on IKEA-cupboard construction. I agree about the ease of building IKEA furniture. How much easier can it be? The instructions are in pictures for Gawds sake! Perhaps Mrs. B and I should set up a business offering to erect IKEA furniture. Offering what to it, precisely, I shall have to decide. I am sorry to hear of the shady history of the store, but recent news about the sacking of a neo-nazi manager is reassuring. I was taught to read English, not bloody hieroglyphics! Whilst trapped in the realms of the unwell, I greatly enjoyed your dispatch sir. I always knew there was a reason for my instinctive hatred towards Ikea. Thank you for making it all clear to me. I have to agree with Ms. B, I myself managed to assemble a TROLLHUNT bookcase and an AARDVARK bedroom dresser without man-servants, or expensive tools. I did however take care to wear my French maid outfit for the occasion. That said, the rest of your article is, as always, refreshingly disturbing- but not altogether surprising, considering that the prospect of any contact with an IKEA store has always filled me with a vague sense of dread, which I can now, thanks to you, put a clear image to. I never for a tick said I could NOT assemble an IKEA product, just that I have never been satisfied with the completed product. I didn’t like IKEA before everyone else started to not like IKEA – I am cool like that. Sir, as usual you have hit the nail (or the little bag of screws) bang on the head! That depressed feeling I get whilst striding through Ikea now makes perfect sense. If it wasn’t (probably) true it’d be funny, my dear Beep. You could always put it on eBay, Countess Carrie, I understand Nazi actifacts are quite sought after..may make up for his scallywag army looting your ancestor’s homes! For some of us, assembling IKEA furniture is one of the greatest joys in life. I find myself bying furniture I neither need nor like, just because it looks like fun to piece together. Going to need a bigger flat soon. I very nearly started ranting about how much I detest even going in that shop * shudders * but you saved me by mentioning John Lewis and took my mind off the horrors of poorly made, unfinished….. argh! My Dear Background Story, I know not whether you be a Lord or a Lady nor where it is you might reside. Either way, is your Motherland a former colony of the British Empire? Fear not, an IKEA does nothing but lower the tone of a country! I am a Lady, my good sir. I quite enjoy reading your blog! I find it both humorous and informative. I do not know much about the British and the Swedes, so I find your musings very interesting. Hmm, a Southeast Asian country the United States has occupied\tampered with, that does not narrow it down (although I can make an educated guess!). Hmm, little good came of any US occupation, The British Empire of course shamefully devatated many countries and millions of lives, yet it was done out of VERY naive philanthropy. The US and its blasted manifest destiny is just totally screwball, I do hope you have not born the brunt. I do hope you have not born the brunt. Ah, thanks for the good thoughts, sir, but alas, the country as a whole has born the brunt. 😦 I am just grateful that we are a happy and resilient people. It is indeed difficult to put us down! Happy Christmas to you, sir! Ps I am about to post a Christmas Message, I apologise that I have not written in your language. It was written while in Sweden and I cannot really edit here on this damn PC in the UK.